Pecan nuts are the product of the hickory tree, also known as Carya illinoinensis. The trees are native to Central and Southern North America, and were utilized as a food source by Native Americans for centuries before the arrival of European colonists. The plants were not actually domesticated until the 17th century, when the first plantations of pecans were established in Mexico. The nuts have a distinctive rich, buttery flavor which often appears in Southern desserts such as praline and pecan pie. Pecans are also used in a variety of savory foods. The trees can live and produce nuts for hundreds of years, if they are in a favorably temperate climate and they are well cared for. Many old pecan orchards have been continuously producing nuts through several generations of cultivation. The trees are deciduous, dropping their leaves in the winter to conserve energy and putting out fresh growth in the spring. Pecans are in the Juglandaceae family along with walnuts, and the leaves of the two trees look very similar, appearing in pinnately compound simple rows on the branch. The pecans appear in the fall. The shells are oblong in shape, yielding ovoid nuts with a very high fat content. The high fat content of pecans causes them to go rancid very easily, so care must be taken in handling pecans to make sure that they stay edible. After harvesting, pecans can be left whole in their shells or shelled using a vacuum pressure unit. The nuts are packaged for sale, ground into pecan butter, or pressed to make pecan oil. When selecting whole pecans in the shell, look for shells without signs of cracks or holes. When shaken, the nuts should not rattle, as this suggests that they are dessicated. Shelled pecans should look plump, with no signs of shriveling or wrinkling. The nuts should be stored in a cool dry place until use, or frozen if consumers are not sure when they are going to use them. In savory dishes, pecans can lend a burst of rich, buttery flavor. Some cooks like to candy pecans and sprinkle them on salads or pastas, especially in combination with rich cheeses like Gorgonzola and blue cheese. The pecan also has a long history as a dessert nut, and appears in candies, pies, and cakes. Many Southern cooks are happy to share pecan recipes with people who ask for them. One of the most significant facts of pecans nutrition is that these nuts are the best antioxidants. If you add a handful of pecan nuts to your daily diet, it will help to subdue the blood lipids to get oxidized unnecessarily. This helps in preventing coronary heart diseases. 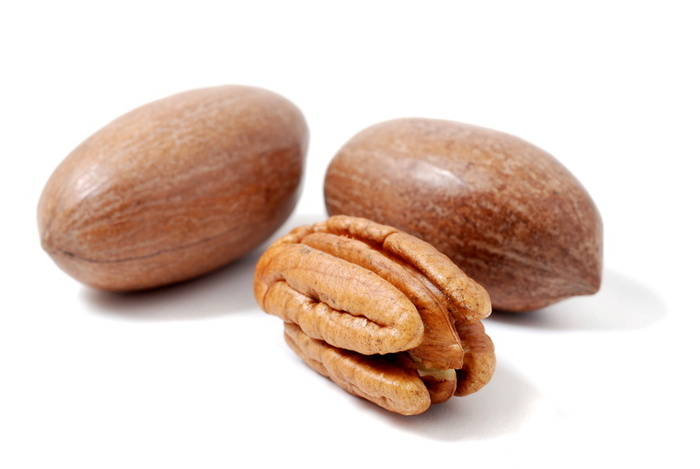 Pecan nut contains vitamin E which is a natural antioxidant that protects blood lipids from getting oxidized. No wonder, pecan nuts are topmost ranked nuts with highest antioxidant capacitance, among all the other nuts. Another distinct factor of pecans nutrition is that they have cholesterol lowering properties. After an extensive research carried out by Dr. Ronald Eitenmiller from University of Georgia, it has been proved that the plant sterols in pecans have cholesterol-lowering characteristics. Research has also confirmed that pecan nuts help in weight loss. According to researches consumption of these nuts help in increasing the metabolic rate of the body and improves satiety. Pecans are called 'heart-healthy' nuts. The reason behind this is that the unsaturated fat content in pecan is supposed to be the heart-healthy fat. Sixty percent of the fat content in pecans is mono unsaturated and the leftover thirty percent is polyunsaturated. This means that the saturated fat content in pecan nuts is very low and the unsaturated fats are heart-healthy. Besides, pecans contain zero trans fats. Coming to the real pecans nutrition, pecan nuts contain 19+ vitamins and minerals. Vitamins from the B group, vitamin A, vitamin E, calcium, potassium, folic acid, phosphorus, zinc and magnesium are also present in pecans. If we look at the daily value of required fiber for our body, pecans provide 10% of the total fiber. Pecans are rich source of proteins and contain less carbohydrates and zero cholesterol. They are best-suited for sodium restricted diet for heart patients and those with high blood pressure, as they are sodium-free nuts. Pecans are one of the very few sodium-free and fiber-rich nuts in the world. Pecans are a rich source of gamma tocopherol which is a chemical compound derived from vitamin E. It supports heart health, prevents heart diseases, promotes respiratory health, helps in blood circulation and is very good for your brain. Pecans also contain some of the phytochemicals. 90% of the fat content in pecans contain unsaturated fats. Pecan might seem to be a high-calorie nut but the best part of those calories is that 90% of fats are unsaturated, apart from pecan being sodium-free. Let's take a look at the calorie count of pecan nut. A serving of an ounce of candied pecans contain 190 calories, 17 g of fat, out of which 10 g are mono unsaturated fats 4 g are polyunsaturated fats. Candied pecans are cholesterol-free. The sodium content in this nut is limited to 75 mg. In our daily diet requirement (based on a 2000-calorie diet), we have been restricted to 2.37 g of sodium. Thus the sodium content in candied pecans is as low as 3%! And if you feel like counting those carbs, they just amount to 30% of your daily carbohydrate needs, with a content as low as 10 g.
Food data reveals that pecan is a healthy and nutritious nut. It is considered as a safe nut for people with heart related problems. In fact, pecan nutritional information reveals that it minimizes the risk of cardiovascular diseases and complications. So, what makes this nut a healthy food item for heart patients? The plus point in consuming pecan nut is that it contain negligible amounts of cholesterol and sodium. Pecan nuts are loaded with natural antioxidant molecules, namely vitamin E and selenium. Consuming them reduces oxidation of the blood lipids and other body cells. To be more precise, these tasty nuts are effective for lowering bad cholesterol and increasing good cholesterol level in the body. Medical researches conducted on heart patients have also proved the cholesterol lowering property of pecan nuts. It is suggested that eating pecans on a regular basis reduces the risk of developing diabetes and gallstones. Despite the high calorie count, pecans are prescribed in weight loss diet program. This is because they boost the body metabolism and help shed calories. By now, you must be already aware about pecan nutrition facts and the health benefits provided by this delicacy. So, do not feel hesitant in including pecans alone or along with other healthy dried fruits in the regular diet plan. Nevertheless, make sure that you include pecan nuts in place of other food items. Pecan nuts appears to be safe for most people with no side effects related to its use; however some may experience an allergic reaction to pecan nuts. In the case of pecan allergy, the immune system reacts to the proteins in pecans and causes symptoms such as hives, vomiting, swelling of the throat, shortness of breath and dizziness that are related to the release of a chemical called histamine.